Think of painting in Spain around 1900, and we tend to envisage the vast golden canvases of Sorolla’s eternal summer. Glorious though they are, he was by no means the only famous painter active in Spain at that time. Allow me to introduce you to Enrique Simonet Lombardo (1866–1927). Enrique Simonet was born in Valencia, and started his studies at the Royal Academy there, before moving to Málaga to complete his training. Enrique Simonet Lombardo (1866–1927), The Burial of Saint Lawrence (1886), oil on canvas, dimensions not known, location not known. Wikimedia Commons. 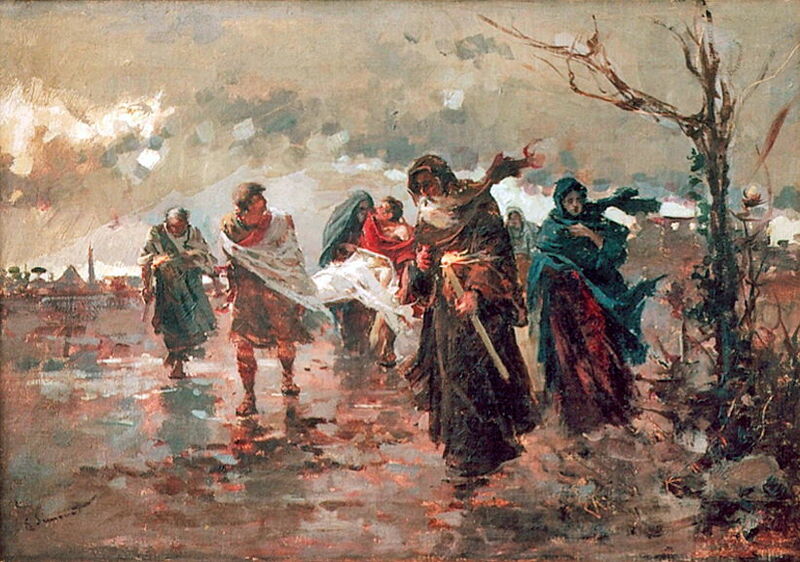 His The Burial of Saint Lawrence (1886) shows how progressive his early style was, with rich use of marks, and rough daubs to form the sky. In 1887, Simonet was awarded a bursary to study at the Fine Arts Academy in Rome, where he created some of his greatest early works. 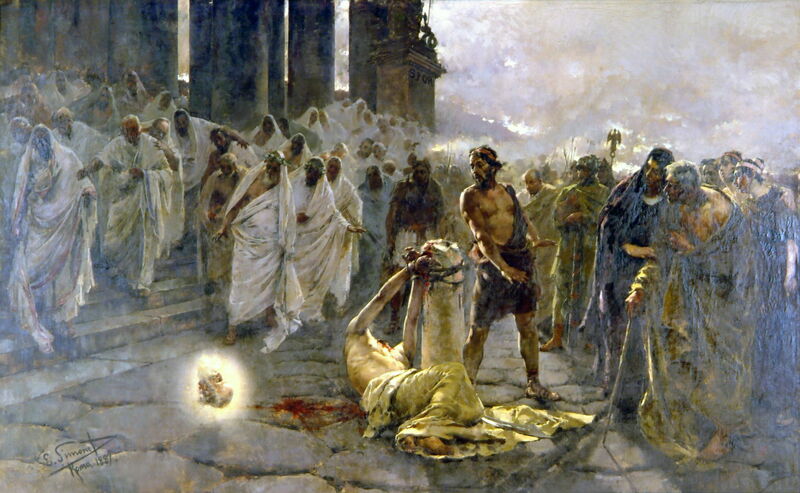 Enrique Simonet Lombardo (1866–1927), The Beheading of Saint Paul (1887), oil on canvas, 400 x 700 cm, Málaga Cathedral, Málaga, Spain. Wikimedia Commons. The Beheading of Saint Paul (1887), a huge canvas in Málaga Cathedral, shows a more macabre sight. Paul’s death is not recorded in the Bible, but in the apocryphal Acts of Paul written in about 160 CE. According to that, Nero condemned Paul to death by beheading. Later legend claims that his severed head rebounded three times, each place that it landed becoming the source of water – hence the location now known as San Paolo alle Tre Fontane (Saint Paul at the Three Fountains). 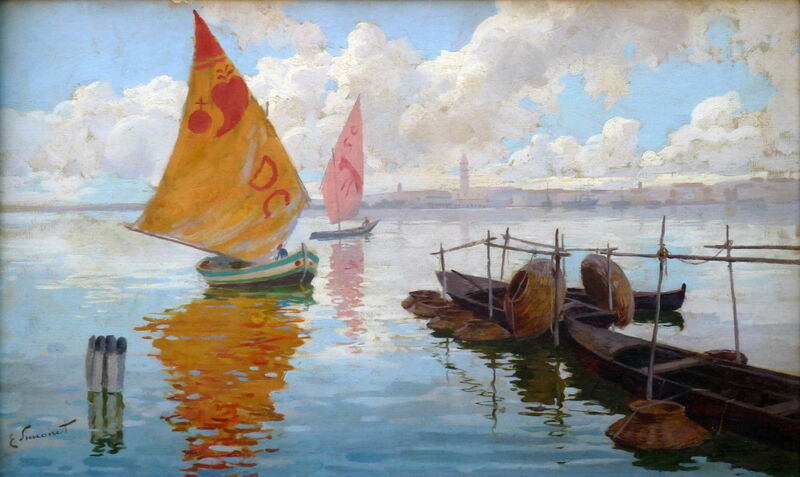 Enrique Simonet Lombardo (1866–1927), Venetian Waterscape (1887-90), oil on canvas, 33 x 58 cm, location not known. Wikimedia Commons. He travelled when in Italy, at some stage visiting Venice to paint his Venetian Waterscape (1887-90), which shows the Campanile of Piazza San Marco in the distance. Enrique Simonet Lombardo (1866–1927), Málaga Beach at Dusk (1889), oil on canvas, 75 x 115 cm, location not known. Wikimedia Commons. He must have painted his Málaga Beach at Dusk (1889) when he was back in Spain during a visit. It shows well his increasing attention to detail which was taking him away from his early Impressionist ways. His first great success was the unusual The Autopsy also known as Anatomy of the Heart; She had a Heart! (1890), painted after he had moved from Rome to Paris in 1889. According to Mireia Ferrer Álvarez, this was shown at the Paris Salon in 1895. It follows a visual tradition which perhaps originated with Rembrandt’s The Anatomy Lesson of Dr. Nicolaes Tulp (1632), and was part of the culture of death which flourished during the 1800s. 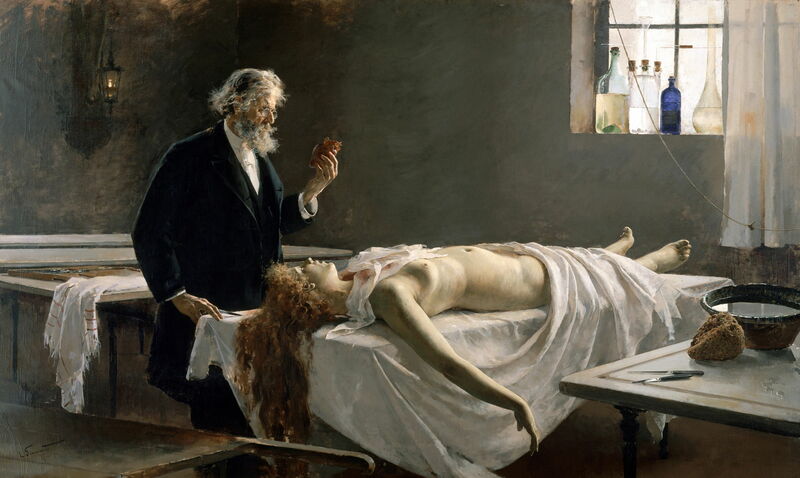 Although more usually expressed in paintings of the Angel of Death, Thomas Eakins – in his The Gross Clinic (1875) – and others had taken their morbid fascination into the anatomy classrooms and the morgues of the day. The body shown is that of a young woman who had drowned herself. The pathologist stands, contemplating her heart, which he has just removed from her chest. Whether she was an Ophelia, or a ‘fallen woman’ who had decided to end her life with one final fall, we shall never know. 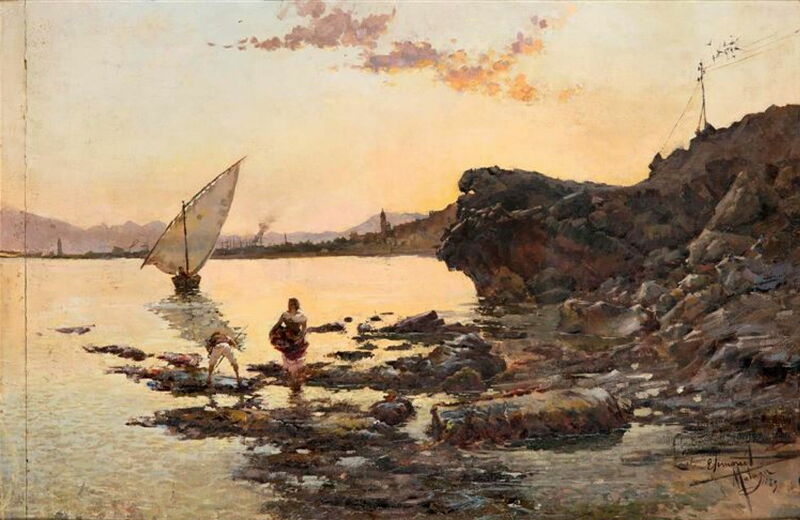 In the early 1890s, Simonet toured the Mediterranean, and visited Palestine. Enrique Simonet Lombardo (1866–1927), Flevit super illam (‘He Wept over it’) (1892), oil on canvas, 305 x 555 cm, Museo Nacional del Prado, Madrid. Wikimedia Commons. 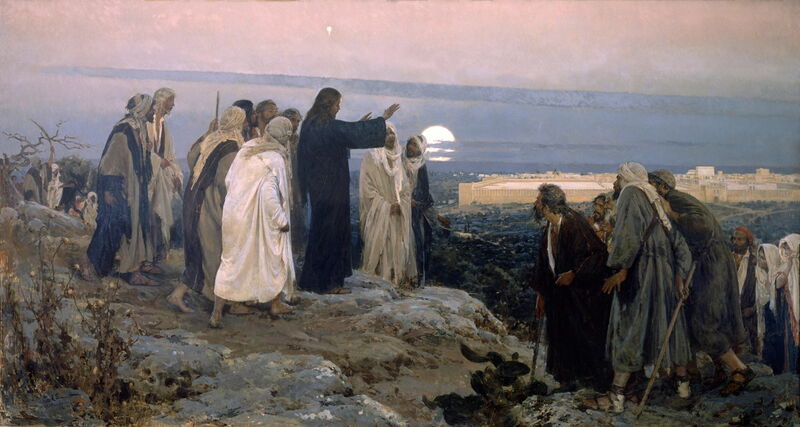 His next acclaimed work was Flevit super illam (‘He Wept over it’) (1892), another large canvas now in the Prado. He painted this in Jerusalem, in response to Luke 19:41, in which Jesus approaches the city of Jerusalem. As he looks at the city, he weeps over it – hence the Latin words from the Vulgate – in anticipation of the city’s sufferings to come. This view is from the Mount of Olives, and won medals in Madrid (1892), Chicago (1893), Barcelona (1896), and in Paris in 1900. Enrique Simonet Lombardo (1866–1927), Smoking Shisha in the Tearoom (1892), oil on panel, 29 x 46 cm, location not known. Wikimedia Commons. Following that, Simonet visited North Africa on several occasions. 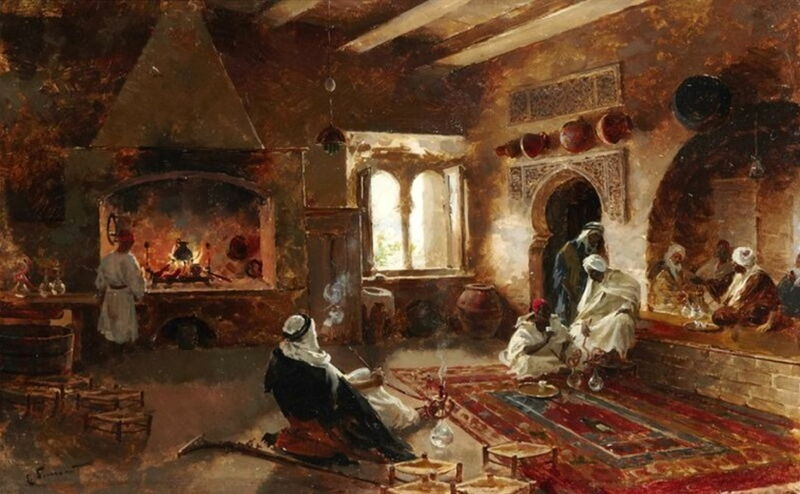 His Smoking Shisha in the Tearoom (1892) shows Arab men drinking tea and smoking shisha tobacco (not hashish) – a brilliant expression of his developing ‘orientalism’. In 1893-4 Simonet worked in Morocco as a war correspondent for a Spanish magazine. Enrique Simonet Lombardo (1866–1927), Dance of the Veils (1896), oil on canvas, 46 x 76 cm, location not known. Wikimedia Commons. 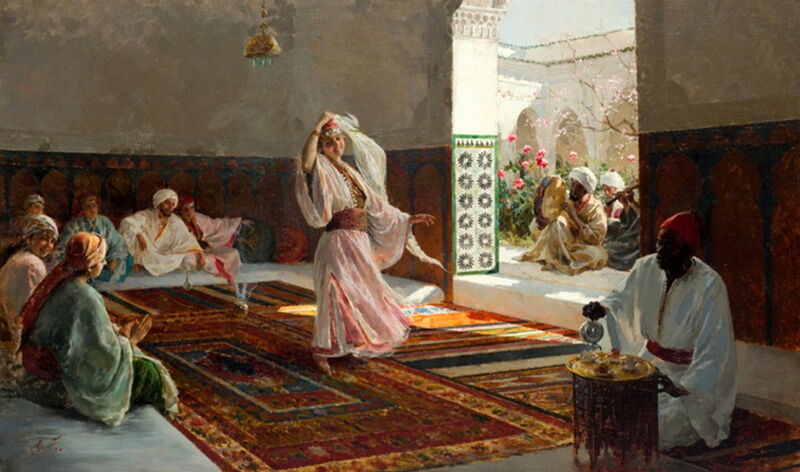 Dance of the Veils (1896) is another classic work from his visits to North Africa. Enrique Simonet Lombardo (1866–1927), The Barber at the Souk (1897), oil on canvas, 32 x 50 cm, location not known. Wikimedia Commons. 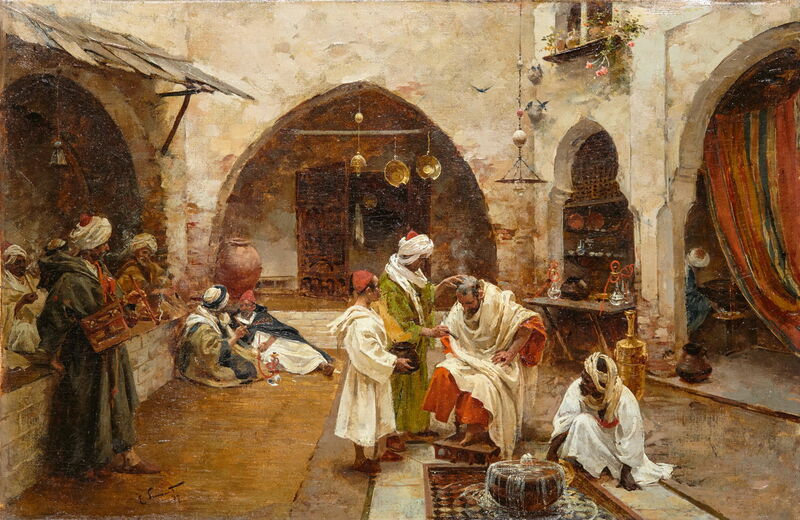 In The Barber at the Souk (1897) he maintained his very detailed realism. Enrique Simonet Lombardo (1866–1927), The Fortune Teller (1899), oil on canvas, 61 x 84 cm, Museo de Málaga, Málaga, Spain. Wikimedia Commons. 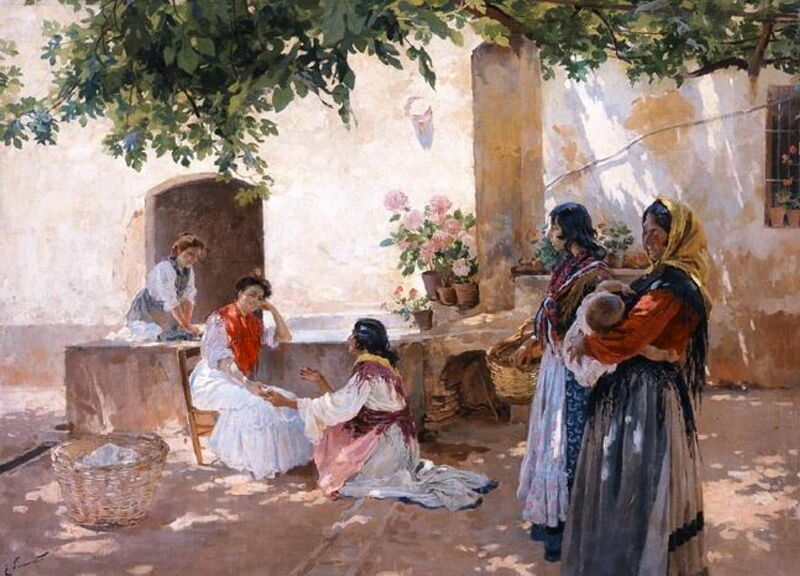 The Fortune Teller (1899) captures the light and atmosphere of Spain. Enrique Simonet Lombardo (1866–1927), La suerte de varas (The Fate of the Rods, first stage of Spanish bullfighting) (1899), oil on canvas, 23 x 38 cm, location not known. Wikimedia Commons. 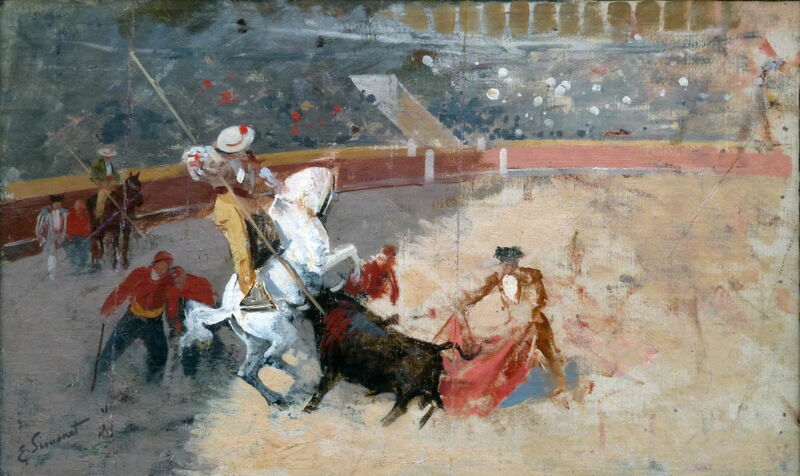 I apologise for showing one of his paintings of bull-fighting, but La suerte de varas (The Fate of the Rods, first stage of Spanish bullfighting) (1899) demonstrates how he could still paint very sketchy and gestural work, and had not become obsessed with detail. Posted in General, Painting and tagged Eakins, Impressionism, orientalism, painting, Post-impressionism, Rembrandt, Simonet, Sorolla, Spain. Bookmark the permalink.